I know that the stuff I think about constantly creates my future. But recently it’s been hard to get myself un-stuck. 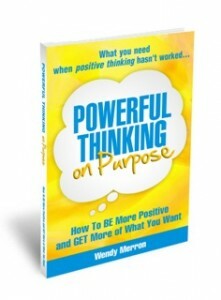 In Powerful Thinking Wendy showed me how do do affirmations in a very different way. Affirmations are now believable and even after a few days I’m aware of how much better I feel. – N.G., New Hope, PA. 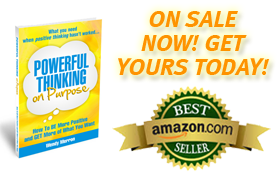 In Powerful Thinking, I share my knowledge and experience from helping thousands of clients to guide you through powerful thought changing techniques that will change your life. With this elegant, simple process, in one night you’ll have the tools and motivation to move forward, direct your thoughts, activate the Law of Attraction, and achieve the life you desire. The only difference between positive and negative people is that the positive people have discovered how to change their mindset. 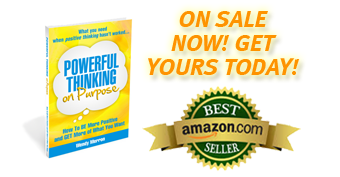 This is what you get in Powerful Thinking On Purpose! Get simple, step by step instructions that you can implement immediately. Get started on the road to a happier life… Click here to order your copy NOW!